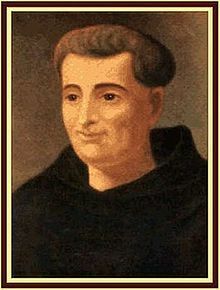 St Anthony (Galvão) was born the fourth of ten children into a deeply religious family at Sao Paulo, Brazil. His father was involved in local politics and he was also a member of the Order of St Francis. At 13, St Anthony followed his older brother to Jesuit school but at 16, wishing to continue a religious life, he transferred to St Bonaventure Friary as a novice in Rio de Janeiro. At 23, St Anthony was ordained a Priest and, returning to Sao Paulo, he immediately set about his new ministry. He worked relentlessly for the poor and those who wished to follow a religious life. He became a highly respected figure, maintained an intense prayer life and was credited with numerous miracles. St Anthony gained notoriety for his, “Paper pills,” after writing a short prayer on a piece of paper saying, “…O Mother of God intercede for us,” and giving it to a woman in severe pain. The woman was miraculously healed, which in turn led many others to request similar, “Paper pills.” St Anthony was canonised by Pope Benedict in 2007. Pray for us that we will place our entire trust in God.